A competent teacher in a quality college program will be of the utmost importance when preparing for auditions. Find out who is winning auditions and what school they attended. There are many classes, masterclasses, and books on the subject of auditioning. Here are my suggestions. • Preparation, preparation, preparation. The primary cause of nervousness is the lack of preparation. • Decide on an interpretation and stick with it – don’t change things at the audition. • Video-tape yourself regularly. This cannot be emphasized enough. • Simulate nerves by running for a few minutes then play excerpts. This increases your heart rate and can you give you that ‘under the gun’ feeling. • Play for many different people including musicians that do not play the bass (cellists are particularly unforgiving). • Do mock auditions with teachers, colleagues and friends. • Study with musicians in the orchestra you are auditioning for. • Study the music. You should own several recordings and printed versions since editions do vary. Get an urtext or unedited / original edition. 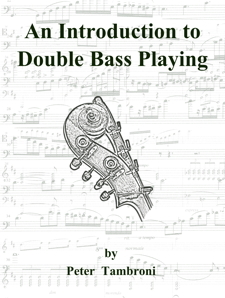 Edited editions such as the Zimmerman excerpt books are very helpful for getting a traditional bass perspective. However, don’t limit yourself to those fingerings! • Solos – some auditions will specify the solo, most will not. Some will give parameters – a movement of Bach, a movement of a concerto, two contrasting movements. If you have the choice, play something you play well. It is better to play an easier piece well than a difficult piece poorly. • Practice auditioning – set aside time in your practicing to run through excerpts with minimal time in between and without speaking, judging, or correcting. • Count rests accurately – know the other parts so you can hear them in your head. • Arrive on time – which means early. Give yourself ample time to warm-up, tune, and be at ease.